Inclement weather - Campus Closes due to snow - the library will be closed as well. Inclement weather - Evening Classes cancelled due to snow - the library will close early as well, Sorry for the inconvenience. The library's entrance doors are locked 15 minutes prior to library closing. The Writing Center is here to help and is located on the main floor of the library. Remember to check out the library calendar during breaks, holidays and finals, since our regular hours may change at that time. Search Hundreds of Databases to Find an Article. Use Full Text Finder is our A to Z list of journals. Search the catalog for an item to borrow from the library. Find a book, DVD, CD, etc. Nexis Uni® - an exciting research solution designed with and for digital natives like you. Nexis Uni® enables quick discovery across all content types, personalized discipline pages for those who set up individual profiles and a collaborative workspace for group assignments. Check it out today and see what amazing things this database brings. IUshare is the Interlibrary Loan department where resources from other libraries are available to IU students. Borrow books, articles, book chapters or anything you need that we do not own or have access to. From local libraries to libraries around the world, IUshare is your source for all academic material. There are over 150,000 ebooks in our collections between the library catalog and Ebsco's Ebook Collection. Either search on the catalog or in the database gives you plenty of choices. To search the catalog click here. To search the Ebsco Database for the Ebook collection available, click here. 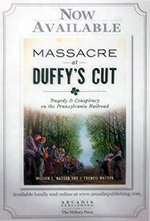 Massacre at Duffy's Cut: Tragedy & Conspiracy on the Pennsylvania Railroad, by William E. Watson and J. Francis Watson. Available direct from Arcadia Publishing or Amazon, Available NOW order your copy today. The libraries Archives are located in the Heritage room on the second floor by the children's section. A great place to explore the history of Immaculata and see some of the older records and artifacts that have been preserved. For more information. Also, check out our Archives Flickr Pages.